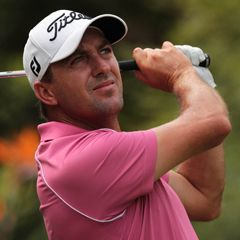 Cape Town - A last-minute call-up to the field for the 2017 Nedbank Golf Challenge proved to be worth a cool R3.5 million to South Africa's Darren Fichardt. Fichardt, initially not in the 72-player line-up for Africa's Major at the Gary Player Country Club, and only the sixth alternate, received confirmation he was in the field mere hours before teeing off after England's Anthony Wall was forced out with a back injury. Fichardt, ranked 87th in the European Tour's Race to Dubai, was the only alternate in the country and a mad dash to Sun City saw him make his 09:00 Round 1 tee time. Fichardt went on to post rounds of 71-69-75-68 for a four-round total of 283, 5-under par, which was good enough for a share of sixth place alongside veteran Lee Westwood - and €208 084 in earnings. Not too shabby for a man who expected to be watching the tournament on TV! Fichardt, who has five European Tour wins and no fewer than 15 Sunshine Tour victories on his CV, is no stranger to the Gary Player CC layout having won the 2004 Dimension Data tournament at Sun City.